The Vanguard Long-Term Treasury Fund (VUSTX) has delivered fantastic returns to investors since its inception in 1986. In the thirty-one years of its existence VUSTX has delivered cumulative total returns of over 850%; equivalent to around 7.6% since inception on an annual basis. Some conservative investor out there holding a chunk of his net worth in the fund has seen every dollar initially invested in 1986 turn into $9.75 as of today. Even after stripping out inflation every initial dollar invested in 1986 would currently be worth $4.40 in real terms. The best part about it? It came entirely from holding long-term US government debt, which is probably as close as you’re going to get to a truly risk free asset. Pretty much the entire portfolio consists of 20 and 30-year Treasuries, with a weighted average maturity of around 25 years. The major downside? In all likelihood it’s a level of performance that’s nigh on impossible to replicate again. Back in May of 1986 the 30-year Treasury was yielding somewhere in the vicinity of 7.5%. That sounds high compared to today (especially to younger ears) but was actually a ten-year low at the time. Five years earlier annual inflation had been running at over 10% and the yield on 30-year Treasuries was topping 14%. In the intervening decades the yield on 30-year Treasuries has collapsed to its current level of around 3%, having hit as low as around 2.25% last summer. The upshot of that trend is that total returns have been nicely supplemented by capital gains. To get a feel for how that has played out in practice let’s just use the past decade’s worth of data. This is a period in which VUSTX’s yield has fallen from around 5% to the current value of just under 3%. Suppose we’ve got a conservative investor back in January, 2007. They’ve got a $100,000 lump sum and they want to park it someplace safe for a decade whilst still earning some kind of real return. With a staring yield of 5% this person concludes that VUSTX would be suitable for the job. Each month the fund pays out its distributions from the interest received on the debt and then automatically reinvests it into more of the same. Given the bonds are backed by the full faith and credit of the U.S. government our investor forgets about it even as the world undergoes a macroeconomic meltdown. Let’s fast forward to the present day. Our investor logs into their Vanguard account and takes a look at the total account balance. The headline figure tells them that the initial $100,000 lump sum is now worth approximately $190,000. That equates to average annual returns of around 6.65%. On analyzing that $190,000 further our investor sees that approximately $135,000 came from capital returns and the remainder from income. In other words around 35% of the wealth creation over the past decade came from capital gains courtesy of rising bond prices. Going forward it’s going to be next to impossible for the Vanguard Long-Term Treasury Fund to replicate that kind of historical performance. When it comes to stocks we have the three components of total returns: growing earnings-per-share, any change in the valuation applied to them, and any cash dividends paid out in the intervening period. In other words a stock that looks overvalued might do well if it posts a high earnings growth rate. With bonds there is obviously no equivalent to that since you’re not owning any underlying business performance. What does that mean for VUSTX going forward? Well, the major difference today is that income investors can’t enjoy the benefits of a high starting yield. Whereas in the past they may have been looking at anywhere between 5% and 8% (or more depending where exactly you start) the fund’s current annualized distribution yield is just 2.98%. That means if yields were to remain constant we would see the fund compound at 2.98% less its fees. The good news on that front is that the expense ratio here is extremely low at just 0.2%. Even so, on a $100,000 investment that’s the difference between $190,000 – the last decade’s total return – and around $131,000. To replicate the period of 1986-2017 would therefore require yields to carry on down the same trend line. I don’t suggest that folks should start trying to predict the inflation and interest rate environment. It’s probably something that wouldn’t have worked well the past few years for example! The balance of probabilities, however, would suggest that 2017-2048 is unlikely to be the same as 1986-2017. That’s not necessarily important by the way. 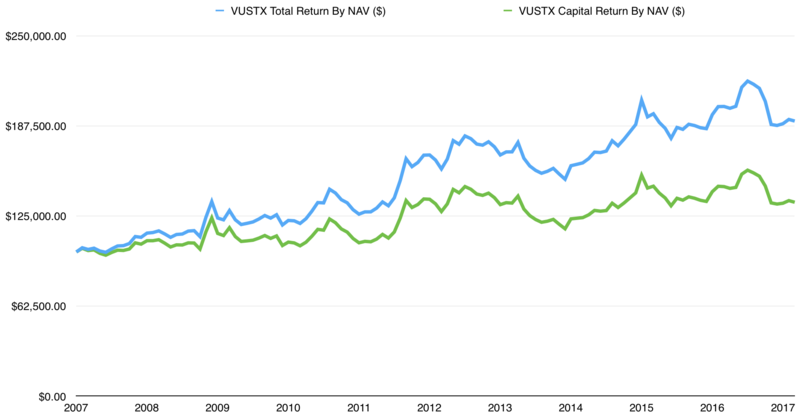 It’s unlikely that those holding VUSTX are doing so in order to smash it out of the park with respect to total returns. And even with a lower return profile bonds can still have a place in your portfolio depending on what your goals are. It may just require some moderation of what the long-term outlook would look like.